Cuban Crafters Murcielago black matte finish humidor is a rich, ebony black humidor and one of our latest creations. It has a Madagascar Ebony matte finish exterior, rich black Ebony wood inlays around the smooth rounded borders and sports a thick Spanish Cedar interior that proclaims class and distinction. This black Ebony humidor's matted finish makes this humidor stand-out unlike any other humidor on the market. This heavy weight brings a Spanish cedar divider, aerator tray and tray divider and easy to carry handles Its solid chrome hardware includes gold-plated hidden quadrant piano hinges, lock and keys, and hygrometer. All matching the beautiful black Ebony exterior and rich Spanish cedar interior. Included is removable wood cover for the brick humidifier and the hygrometer is built into the front of the humidor. Its dimensions are 15 wide X 10 depth X 6 height, and it has a capacity for 150 cigars. 15 wide X 10 depth X 6 height, and it has a capacity for 150 cigars. Spanish cedar divider, aerator tray, tray divider, gold-plated hidden quadrant piano hinges, lock and keys, and hygrometer. 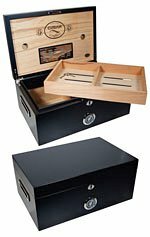 If you have any questions about this product by Cuban Crafters Murcielago humidor, contact us by completing and submitting the form below. If you are looking for a specif part number, please include it with your message.